Hunger is not just a problem for distant nations. It happens right here in the United States. More than one in ten (12.3%) American households were uncertain they would have enough food for all members of their household at some point in 2016, and of those households, around two out of five had members who missed meals (USDA ERS). The Sudbury Community Food Pantry has been working for 28 years to move the needle on hunger in the Boston Metro West Region of Massachusetts. Thanks to the hard work of their volunteers, innovative approaches to service, and generous donations The Sudbury Community Food Pantry recently expanded its operations with a container-based storage for dry goods. The Sudbury Community Food Pantry is unique because it doesn’t require people to reside within the town of Sudbury to receive food assistance, and many people feel their approach to service is worth the drive. In fact, in 2017 the pantry provided food to families from 65 cities and towns in the Metro West Area and beyond. Sudbury Residents may receive assistance twice a month and non-Sudbury residents once a month. After people heard about The Sudbury Community Food Pantry’s unique approach on “Chronicle,” a nightly TV news magazine, the number of clients requesting services grew dramatically. People began making the trip both because they can expect to leave with five to six full grocery bags and because The Sudbury Food Pantry prioritizes creating a respectful and dignified client experience. Instead of receiving bags of pre-packed food, clients browse the aisles of The Sudbury Community Food Pantry with carts and select their preferred food items. 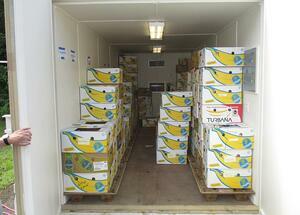 Clients have the opportunity to select fresh produce and meats, which are too often missing in emergency food services. The pantry also distributes essential personal care items such as soap, tooth paste, and toilet paper—items not covered by food stamps. The pantry needed to scale up quickly. By law, dry goods, like canned food, had to be kept within a set temperature range to minimize the risk of spoilage. Requests for bulky personal care products, like toilet paper, also drove the need for storage space. With financial support from Our Lady of Fatima parish, TJ Maxx, and other charitable grants, the pantry more than doubled its refrigeration space and expanded its dry goods storage capacity with a 160 square-foot climate-controlled shipping container. As a non-profit, The Sudbury Community Food Pantry does a lot with a little, and they’re ready to make the most of their benefactor’s generosity. In 2017, its 89 volunteers contributed a staggering 6,351 hours to serve 909 families. 88% of all donations directly pay for food and personal care products, and the remaining 12% covered essential expenses like truck rental, insurance and operating supplies. “We’re 100% volunteer run. Nobody gets a dime. We couldn’t do this without the support of our community,” said Mullen. You can help even if you’re far from Massachusetts! 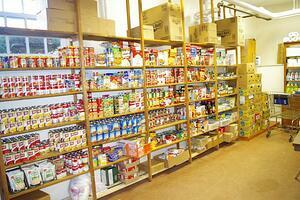 While donated food items are appreciated, the Sudbury Food Pantry can do a lot with a dollar. Strong relationships with The Greater Boston Food Bank, grocery chains, and local farmers enable the pantry to make extremely cost-effective food purchases. 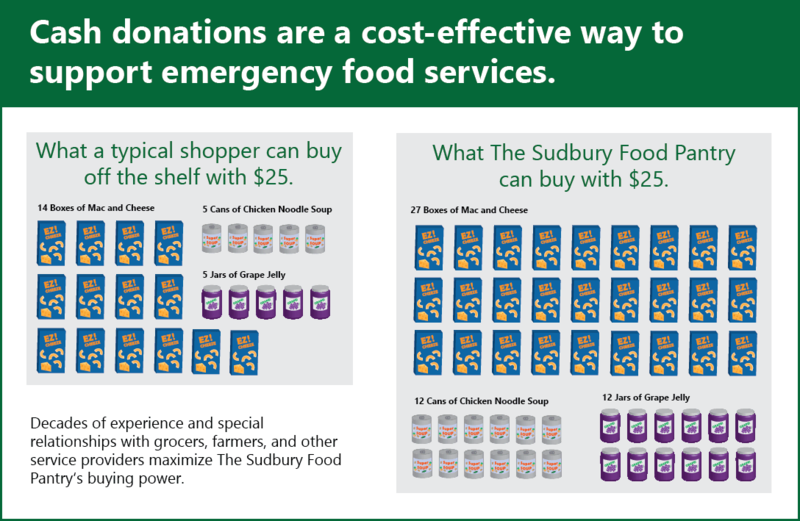 For example, The Sudbury Community Food Pantry can purchase 27 boxes of mac & cheese, 12 jars of grape jelly, and 12 cans of chicken noodle soup with just $25.00. An average consumer buying the same items off the shelf at the local grocery store would expect to pay $52.80. When it comes to food their expertise effectively doubles their buying power. Cash also helps cover that 12% of operational expenses. 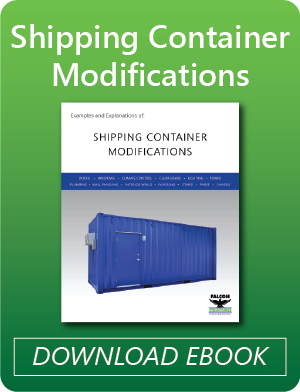 We often talk about how shipping containers can help businesses quickly scale up, and it’s amazing to see the same in a worthy non-profit. If you’d like to donate, visit their website.